Snoring occurs when the muscles and soft tissues in the throat and mouth relax, shrinking the airway. The smaller airway increases the speed of required air, causing soft tissues to vibrate, resulting in a snoring sound. At certain levels of severity, the tongue and soft tissues can cause complete blockage of the airway. If this period of blockage lasts longer than 10 seconds, it is called Obstructive Sleep Apnea. Sleep apnea is a serious sleep disorder that occurs when a person’s breathing is interrupted during sleep. People with untreated sleep apnea stop breathing repeatedly during their sleep, depriving the brain and the rest of the body of oxygen. A C-Pap (continuous positive airway pressure) device or surgery often treats moderate to severe sleep apnea. However, people with mild sleep apnea, or those who are C-pap intolerant, can often treat their sleep apnea with a dental device. At Adams and Cheek Dentistry, we can have a lab fabricate a dental appliance to help with mild sleep apnea as well as snoring. 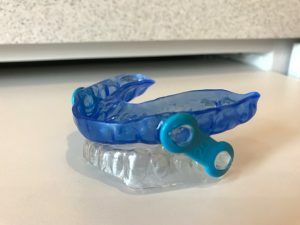 This dentist prescribed oral appliance, or snore guard, is a custom-fabricated dental device that moves the lower jaw into a forward position. The snore guard position increases the space in the airway tube, reducing air speed and soft tissue vibration. The fit of this snore guard is comfortable, permitting small movements of the jaw and allowing unrestricted oral breathing. Wearing this dental appliance reduces snoring and improves oxygen intake. Please feel free to contact our office by clicking here with any questions about our snore guard/sleep apnea device. You can also reach us at 919.866.1360. We may have a solution to your (or your partner’s) sleepless nights!